CINCINNATI -- Johnny Cueto enjoyed the hugs and the applause. He didn't care much for one horrid inning that put him in line for a loss - until the Reds' bullpen got involved, of course. 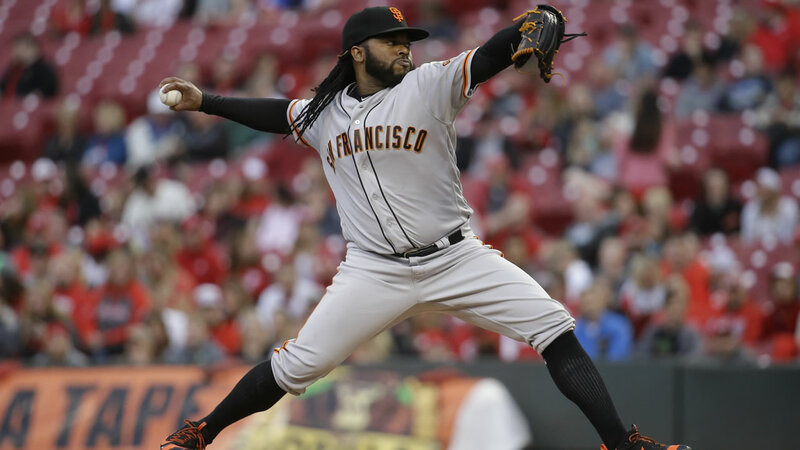 The Reds roughed up Cueto in his return to Great American Ball Park, but the San Francisco Giants rallied against Cincinnati's historically bad bullpen, riding Brandon Crawford's three-run homer to a 9-6 victory Monday night. Joey Votto hit a three-run homer as the Reds piled up six runs in the third inning off Cueto, who got a warm welcome from his former teammates and fans before the game. It was Cueto's worst showing since he gave up eight runs during Kansas City's 11-8 loss at Toronto in the AL Championship Series last season. Cueto threw 46 pitches during the inning, the most since he threw 49 in the first inning against Philadelphia on June 6, 2009. "Things didn't come out the way I wanted to," Cueto said through a translator. "I felt normal. There's nothing I could do. The game just changed right there." It changed again when the Reds' bullpen let a 6-3 lead slip away. Brandon Belt and Gregor Blanco singled in runs off J.C. Ramirez (0-2) in the seventh. Crawford connected off Drew Hayes for his third homer and an 8-6 lead. Crawford also singled home a run in the ninth, giving him four RBIs against the Reds' bullpen - his total for the previous 17 games combined. "I've felt pretty good at the plate lately, but I haven't been getting a lot of hits," Crawford said. "I felt like my swing was there and I just had to stick with it." Crawford's homer was the 22nd allowed by Reds relievers in 26 games, by far the most in the majors. It was the 20th straight game in which Cincinnati's bullpen has given up at least one run, tying the 2013 Rockies for the longest such streak in the majors since 1900, according to information from the Reds provided by the Elias Sports Bureau. "It's hard finding a recipe right now," Reds manager Bryan Price said. "We're bringing up guys who might not be ready. Guys are pitching out of their roles. We've got to get healthy. They're getting a lot of opportunities. Nobody's rotting down there." Vin Mazzaro (1-0) retired two batters. Santiago Casilla set down the side in the ninth for his fifth save in seven chances. Price and numerous Reds players embraced Cueto during batting practice. Most of the 13,829 fans applauded as he took the mound in Cincinnati for the first time since the Reds traded him to Kansas City last July, the start of Cincinnati's rebuild. Cueto signed a $130 million, six-year deal with the Giants in the offseason. Cueto came to bat with the bases loaded in the second inning and singled home a pair of runs off Brandon Finnegan, but the right-hander couldn't hold an early three-run lead. The Reds sent 11 batters to the plate for six runs in the third. Billy Hamilton doubled home the first run, Votto hit his third homer, and Jay Bruce had an RBI triple. The Reds put together three singles, two walks, a double, a triple, a homer and a stolen base during the inning.